Change through a spectrum of colours known as ‘colour play’ commonly red, very quickly through yellow, moving through green and blue. 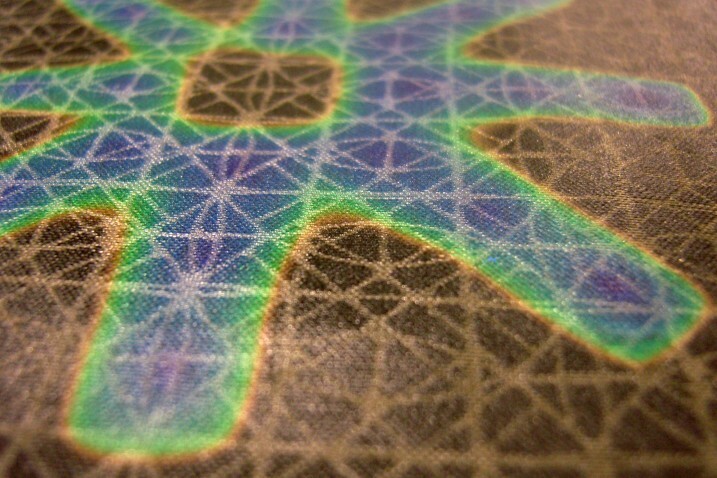 The liquid crystal thermochromic materials produce colour structurally – as temperature is raised the structure of the material changes – each phase of change of the structure interacts with incident light differently allowing us to see a different colour at each phase of the change. The colours look like coloured light (although they are non-emissive) and have an iridescent quality (different colours can viewed from different angles). 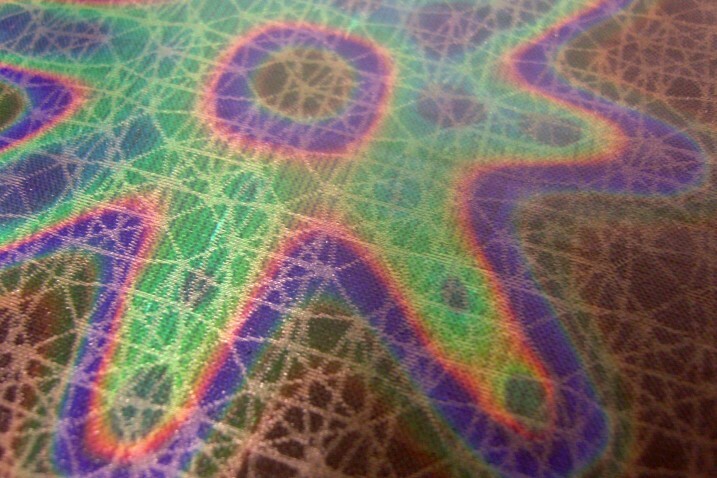 Liquid crystals can be screen-printed, sprayed or coated onto a wide range of surfaces. They come as microencapsulated slurry, which can be mixed with different binders to achieve different surface effects. These come in a variety of forms, dispersion (ink concentrate /pigment), powder or plastic pellets and change from colour to colourless on temperature increase. These are more commonly used on textiles in the design disciplines but are used in other areas. They are often screen-printed with appropriate binder systems but inks have been developed for other printing or coating processes and also for bath dyeing systems. 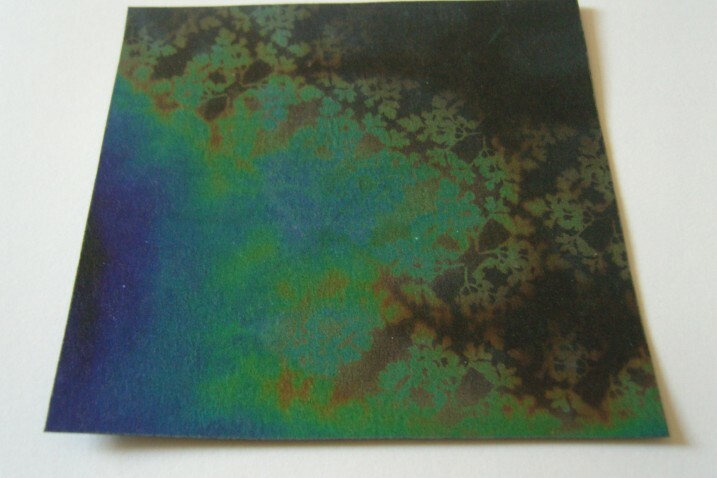 They can be applied through other means such as spray coating or transfer. It is also possible to produce thermochromic plastic products and they can be extruded mixed with other polymer as masterbatch. As the product is available in these different forms it is possible to experiment with combining them with different binders, coatings and polymers to apply them in more interesting or experimental ways to a broader range of materials. 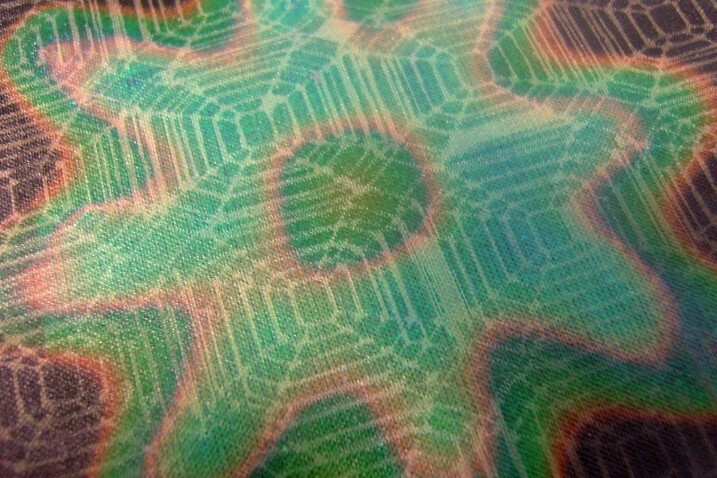 More recent developments have been single colour liquid crystals these liquid crystals show a single colour above or below a certain temperature. They are interesting in the way they are produced which subdues the rest of colours in the spectrum and enhances one colour (for example violet, purple, red or yellow). This in principle allows you to design a very precise relationship between temperature bandwidth and the colour that will be visible throughout that range of temperatures. Once the temperature is raised above or drops below the set range of temperatures that colour will disappear revealing another colour/information or original material. 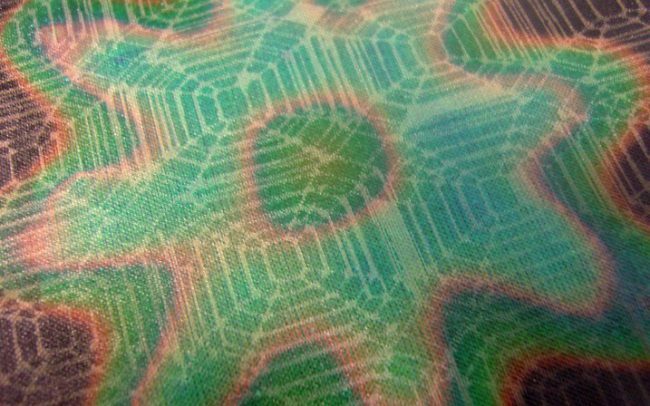 The colours produced as single colour liquid crystals are unusual – although they only show one colour the colour has a depth and richness that would be very hard to achieve another way. 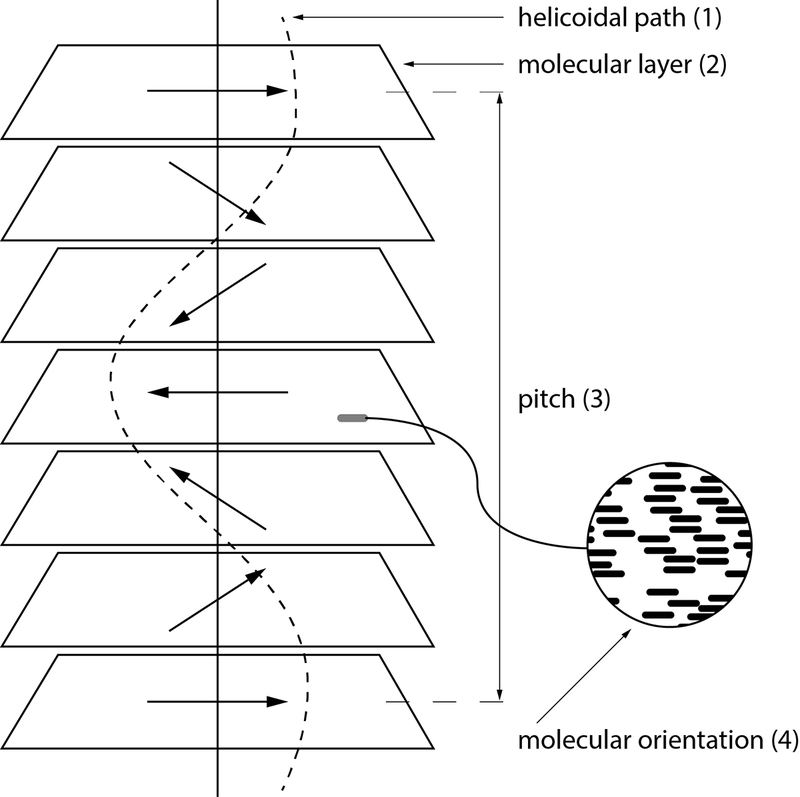 This liquid crystal system is still under development and is currently called a scattering liquid crystal. It is a modification of the single colour liquid crystal systems. This system scatters light rather than selectively reflecting it with the result that the colour change is to or from white (more off-white than pure white), above or below a certain temperature. This gives rise to a high contrast colour-change effect, from essentially white to another colour, which has not been achieved before. With the use of dyes, coloured filters and different coloured backgrounds, a wide range of single colour change combinations can be achieved. This system is not yet fully developed but offers exciting potential for design. 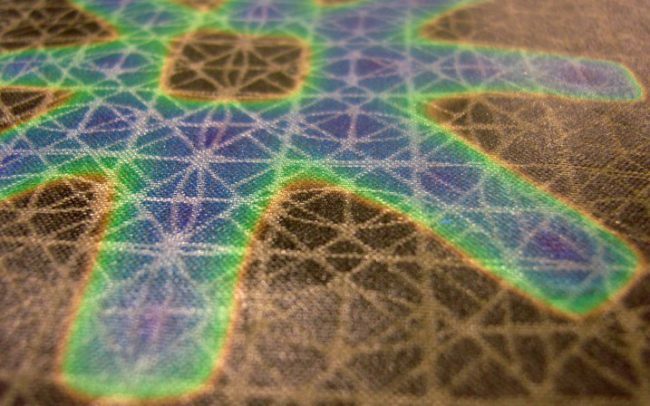 There are irreversible thermochromic systems including paints and pigments. These are used in temperature sensing products to signal if a critical temperature has been reached. The more time is spent learning through making with these materials the more they reveal about their possibilities. They are sometimes simple and sometimes complex – they have many qualities that have not been fully explored. UV light and other external elements degrade thermochromics but these can be controlled with additives – however their degradation could be used as a positive feature of the material. They signal change in temperature – they make energy visible – and as they are degraded over time they tell us about the environment they are in through a more permanent colour and pattern change. 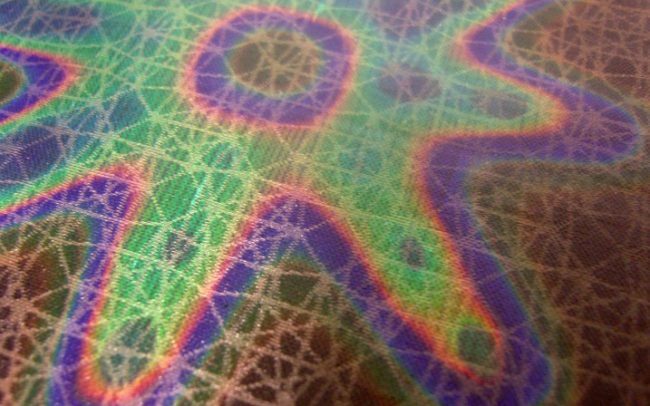 This research was supported by LCR Hallcrest Ltd who develops these new materials and is a UK manufacturer of thermochromic temperature sensing labels and materials.